Home Electrification Bi-mode trains: Unlocking opportunity? Bi-mode trains in self-powered mode incur performance and/or range penalties compared with operation from the electricity supply. 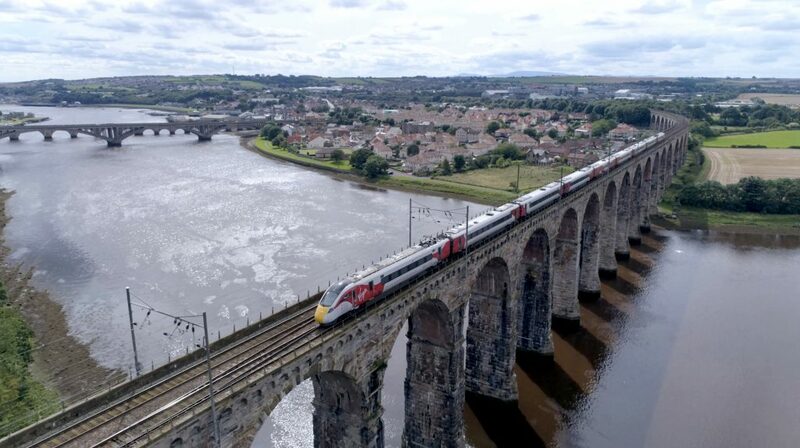 Virgin Class 800 crossing the Royal Border Bridge, Berwick-upon-Tweed. Technology There are two key technologies that, currently, are reasonably proven to enable electric trains to move beyond the electrified network. The first is a battery, such as that used on the Class 379 IPEMU (Independently Powered Electric Multiple-Unit) trial carried out in 2015/16. These trains have a range, typically, of less than 80km. Battery vehicles can be connected to fast chargers (which, of course, need a power supply) at, say, terminal stations, and can be charged during regenerative braking, which might extend the range a little. Traction performance on batteries can be similar to that achieved when powered by the catenary but, overall, a bi-mode battery/electric train will have slightly reduced performance than its straight-electric equivalent, for a given size of traction motors, due to the mass of batteries. If the electrical supply comes from a carbon-free source, then this technology is carbon-free throughout the operating cycle. Batteries also add no noise or vibration. The Achilles’ heel of batteries is usually the recharging time; as a rule of thumb, batteries take at least as long to recharge as they take to discharge. However, both range and recharging time are likely to improve over time, given the intense research and development into battery technology around the world. Diesel power provides a much greater range than battery as diesel fuel has some 50 times the energy density of a typical battery and can be “re-charged” comparatively quickly. Effectively, the range is limited only by the amount of fuel that the vehicle can accommodate. However, diesel performance is often reduced compared with electric operation. Based on sparse published information, diesel-electric bi-mode trains generally have diesel engines producing less peak power than the vehicles deliver at the rail when operating from the catenary; a significant deficit. Comparing power ratings Rolling stock engineers get excited by a train’s power rating, tractive effort and power-to-weight ratio. The latter is generally taken to allow comparison between different trains’ intrinsic performance capability. But does it? Here is a simplistic comparison between how diesel and electric power ratings are usually described and why there might be differences between diesel and electric trains. Effectively, the range is limited only by the amount of fuel that the vehicle can accommodate. Diesel engines are not, of course, free from harmful emissions, but the levels are low for engines that comply with current EU regulations. Take two trains, to the same general design from the same manufacturer. One is a diesel and has a diesel engine or engines capable of delivering 3MW. The other is an electric train with four 750kW electric motors. They both obviously have the same power-to-weight ratio, right? Well, probably not – the electric train will quite likely have the better performance as it will be lighter. Diesel engine power output is usually quoted as the output at the flywheel, although it might be the output of the alternator for diesel alternator sets. Some power is used to feed all the auxiliaries such as compressors and the train heating, lighting and air conditioning. In addition, the main output has to pass through a three-phase drive before the energy is fed into the traction motors. Both the auxiliaries and inefficiencies in the drive system reduce the power available to the traction motors. This might amount to 10 per cent, reducing the 3MW diesel train’s output from the traction motors to as little as 2.7MW. This is the maximum power that the diesel train can produce for traction purposes. In contrast, an electric train’s power output is usually specified as the continuous rating of the traction motors. What this means is that if 3MW is stated, then 3MW is what is delivered. However, traction motors usually have a peak rating known as the “one-hour” rating. This can be up to 25 per cent higher than the continuous rating so, for example, the one-hour rating could be 3.7MW. What this means is that, for two trains with nominally the same power output, the diesel delivers a maximum of 2.7MW from the motors whereas the electric train can, in short bursts (such as when accelerating), deliver 3.7MW. It is also lighter, increasing the power-to-weight ratio still further. What does this mean for bi-mode trains? If there is a requirement for the bi-mode train to have the same performance in either electric or diesel mode, then the headline output of the diesel engine(s) needs to be higher than the nominal electric rating – for this example, the diesel rating would need to be in the order of 4MW. So far, all bi-mode trains have been specified with diesel engines with a lower rating. This is not surprising, as the basic assumption was that the best performance was required on the busiest parts of the railway which would be electrified. The diesel performance was only required to be broadly comparable with or better than the diesel trains being replaced on the diesel sections of line. With the ambition to deliver the performance of an electrified railway with bi-mode trains over large sections of railway where electrification has been cancelled, diesel and electric power ratings for bi-mode trains to be used on these routes will inevitably need to be revisited. Bi-mode or tri-mode? In addition to the engineering question of power ratings, many people intensely dislike the noise and vibration of under-floor diesel engines. Moreover, even the latest diesel engines are not free of CO2 and other emissions, and the equipment required to make them acceptably clean adds to the maintenance cost. Both technologies require space on the vehicles and add mass, which is ‘dead weight’ when operating on electricity. Although there is currently no UK application, engine supplier MTU provided a paper at Railtex 2017 on diesel/battery/pantograph electric hybrid trains – which they called tri-mode. This offers several possibilities including regeneration into batteries when operating in self-powered mode, and then using the batteries to assist the diesel engine in acceleration, and operating on battery only in, for example, station areas. This can deliver significant savings. As David Shirres said in his review of Railtex: “Another energy-saving arrangement was on display at the MTU stand. Their hybrid power pack has a 390kW diesel engine and 400kW electric motor connected to a separate Li-ion cell battery module. Three years of trials on a DMU in Germany demonstrated that this unit gave fuel savings of 18 per cent on a 23km route with nine stops. In addition, noise and pollution at stations were significantly reduced.” Even better might be diesel/pantograph-battery-electric train – the ideal go-anywhere train with the means to use the battery to supplement the diesel engines during acceleration. Inter-city routes The roll out of bi-mode trains in the UK has inevitably been linked to the electrification programme for the Great Western (GW) line from London Paddington to Oxford, Newbury, Swansea and Bristol. Indeed, the original specification provided for electric, self-powered and bi-mode versions. The Government started work on the specification for the HST replacement around 2005 and announced that Agility Trains had been selected as the preferred bidder in early 2009, but it was not until 2011 that electrification of the GW line was confirmed. It was after the electrification programme was announced that the contract was placed for what became known as the Intercity Express Programme (IEP). With the advent of GW electrification, no one ordered any self-powered versions. The notion was that electric trains would operate trunk routes and that routes which extended beyond the electrified lines would be operated by bi-mode trains. Details about who has ordered what comes later in the article. On the East Coast main line, trains to/from London and Leeds, York, Newcastle and Edinburgh will be operated by electric trains while other services, such as the London to Inverness and Aberdeen through-trains, will use bi-modes. There was debate at the time about whether it was appropriate to run trains fitted with a number of idle, and heavy, diesel generators ‘under the wires’, but it has to be said that the bi-modes represent an improvement over operating the pure-diesel trains in these circumstances. On the GW lines, there were significant time and cost overruns for Network Rail’s electrification of the originally proposed routes. Similar to the East Coast, the original plan involved obtaining a number of electric trains for the trunk London to Cardiff, Swansea and Bristol routes and bi-modes trains for the routes going beyond the wires, such as to Gloucester. Separately, First GWR had ordered a number of bi-mode trains with higher-powered diesel engines and larger fuel tanks to help them tackle the hillier South West route to Exeter, Plymouth and Penzance. Once the scale of electrification delays became clear (electrification to Cardiff prioritised but delayed, wires to Bristol, Swansea and Oxford delayed beyond CP5 or cancelled), the orders were changed. At an unspecified cost, all of the DfT-ordered electric trains were re-specified as bi-modes and GWR added a small number of additional trains to their order to cover routes such as London to Oxford. 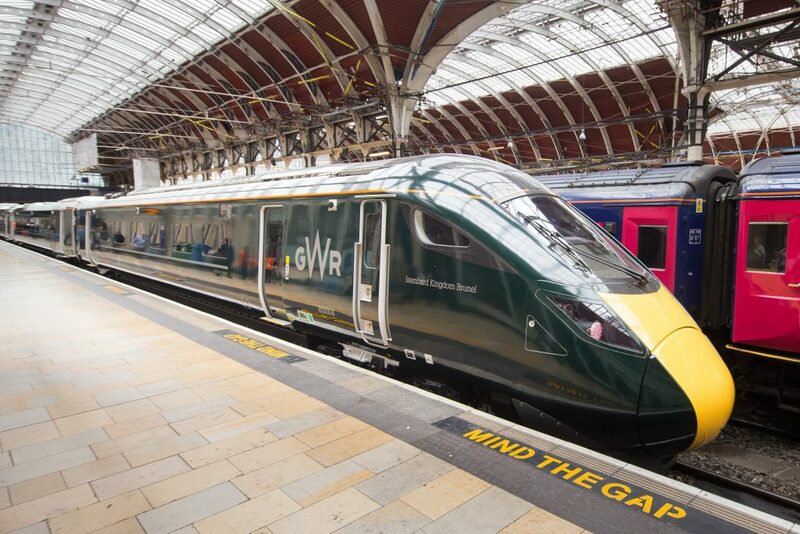 In July the Government announced that “new (bi-mode) technologies mean that we can improve journeys for passengers on the Great Western Main Line in South Wales” and that, as a result, there is no need for electrification between Cardiff and Swansea. At the same time a decision was taken to uprate engines on the route’s bi-mode trains from 560kW to 700kW. The engines were originally rated at 560kW to minimise fuel and maintenance costs as well as to improve reliability. At the time, their initially low output was not a problem for a train that would not be diesel-powered very often. Their upgrade is a variation to the contract for the supply and maintenance of these trains and so comes at further unknown cost. As will be seen, even when uprated, the power output from these engines is still only 80 per cent of the train’s electric mode. The Government’s claim that bi-mode operation improves passenger journeys thus ignores the facts. Hull trains and TransPennine Express have also ordered trains based on the five-car version of the Hitachi train being supplied to GWR for the South West route services. Regional services When the Government announced that Abellio had won the Greater Anglia franchise competition, there was much surprise – both that they were replacing their entire fleet and that 138 of these new vehicles would be bi-mode trains. Little has so far been released on the benefits of these on the Greater Anglia routes, but it is to be expected that the trains will provide much-improved performance compared with current diesel trains when operating ‘under the wires’. This will help to maximise the capacity of the congested electrified main line. In late 2016, Northern stated it was seeking to extend the reach of the class 319 trains that have been leased for the North West Electrification programme and is co-operating with Porterbrook in converting eight of them into bi-mode trains described as class 319 Flex (to be designated Class 769). Abellio Wales and the Welsh Assembly Government announced in July 2017 that they would take five Class 769 trains, operated in diesel mode, to cover for Sprinter DMUs that need to have modifications carried out to conform to the Technical Specification for Interoperability – Requirements for People of Reduced Mobility. Inter-City Express Train/Programme (IEP) Looking in detail at which trains are on order, some 182 Hitachi Class 80X trains, in a mixture of five-car and nine-car formations and totalling 1,223 cars, have been ordered for four operators using three leasing companies as outlined in Table 1. The only operator that will receive pure-electric trains is Virgin Trains East Coast, although even these will be fitted with one diesel generator to provide auxiliary supplies and limited movement capability in the event of the loss of the catenary supply, overcoming an issue that had caused much trouble on the Class 91/Mk4 sets currently in use. In the event of catenary damage, ECML trains will be able to power through failed OLE, albeit slowly, after the wreckage has been cleared away, reducing the impact of such a failure which today would stop all but diesel services. There has been criticism of carrying diesel plant on trains running on electricity, but the mass of the auxiliary generator is estimated at about one per cent of the mass of a nine-car train. In fact, the mass of the diesel plant of the bi-mode trains is not huge; it is estimated that the weight increase between a nine-car class 801 electric train and a similar class 800 bi-mode is about 20 tonnes, which represents less than five per cent of the total. Class 80X trains are being supplied in five-car and nine-car formations using 26 metre long cars. Five-car trains have three motor cars (12 traction motors), plus three MTU 12V 1600 R80L (12-cylinder, 21 litre) diesel alternators on the bi-mode sets, while nine-car trains have five motor cars (20 traction motors) and five diesel alternators on the bi-modes. With the recent uprating of Class 800/0 engines, the only difference between the DfT-ordered Class 800 and GWR-ordered class 802 is the size of the fuel tanks. Class 800 trains have 1,300 litre fuel tanks whereas those in the Class 802 have a capacity of 1,550 litres. As to performance, there has been a great deal of speculation about how well the Class 800 and Class 802 will perform, both compared with the HST they will replace and comparing their diesel and electric modes. The power-to-weight ratios in Table 1 are based on the published electric motor and diesel engine ratings. Train masses have been estimated by the writer from the mass of the class 802 nine-car train. Compared with the HST, which has a power to weight ratio of approximately 8.2kW/tonne, class 80X has an improved power to weight in electric mode. In diesel mode, Great Western 80X units are comparable with HSTs. 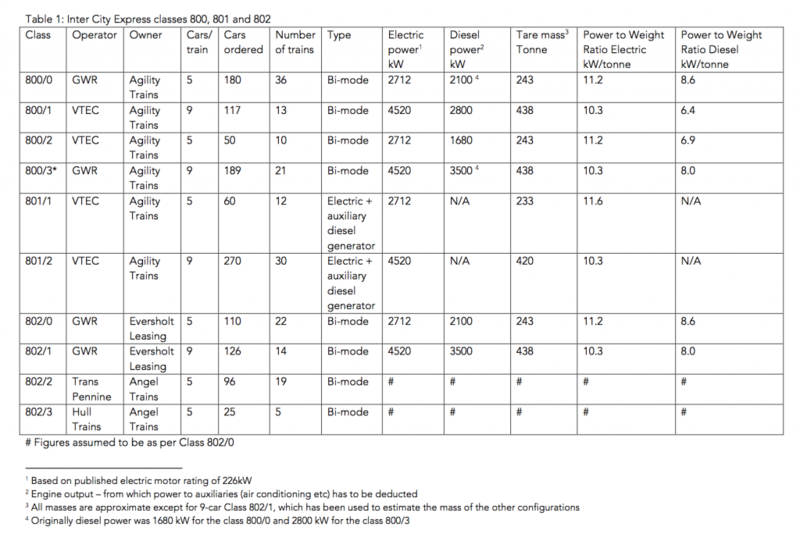 However, East Coast class 800s have a noticeable performance deficit compared with HST, and so are unlikely to be capable of achieving HST timings in diesel mode unless their engines are also uprated to 700kW. Abellio Greater Anglia – Stadler As part of its commitment to replacing its entire fleet, Abellio Greater Anglia has ordered 38 bi-mode FLIRT UK articulated trains (14 three-car and 24 four-car units plus, in each case, a seven-metre-long engine pod) from Stadler for its cross-country services, the aim being to take advantage of 25kV supply where it is available. The electric power rating for both length trains is some 2.5MW. There is a diesel performance deficit which will be more severe on the three car sets. Four-car sets will be fitted with four 480kW diesel generators whereas the three-car sets will only have two. The Stadler trains are fully articulated and the diesel generator sets are fitted above the train floor in short engine cars, effectively separating the “noisy, smelly, vibrating parts” from the passenger space. Moreover, if the lines are eventually electrified, or some other fuel source becomes the norm, the engine cars could be removed quite easily. 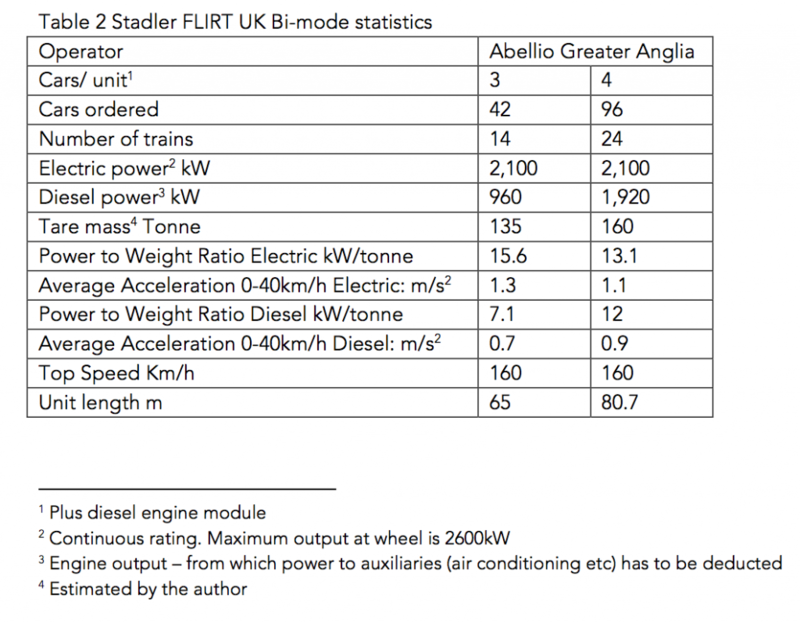 From the published figures, the bi-mode FLIRT trains will have significantly improved performance compared with Abellio’s existing diesel trains when running over the 25kV routes with an average acceleration rate from 0-40km/h of 1.1m/s2 and 1.3m/s2 for the four-car and three-car sets respectively. In diesel mode, compared with existing diesel trains, the four-car set’s performance will be improved and the three-car sets will be at least comparable. This is based on acceleration values from the Stadler leaflet available at Railtex 2017 and estimated power-weight ratios shown with other vital statistics in Table 2. Porterbrook/Northern Class 319 Flex In December 2016, Porterbrook Leasing announced that it was developing a bi-mode version of the Class 319 EMU. These Class 769 units, which are both 750V DC and 25kV AC capable, have recently been replaced on Thameslink by new Class 700 trains and many of them are being transferred to Northern. It was realised that these trains would be able to provide more through journeys if the trains could operate independently of the 25kV supply. The trains will use two diesel generator sets, one under each driving trailer car. Each generator set will comprise a MAN D2876 horizontally mounted six-cylinder, 12.8-litre diesel engine driving an ABB alternator. The specification sheet for the engine suggests output settings in the range 310kW to 390kW. Taking a nominal 350kW per engine gives approximately 700kW on diesel power, which is lower than the reported rating on electricity of approximately 1,000kW. Reports suggest that the diesel performance will be comparable with Pacers and class 150 DMUs. 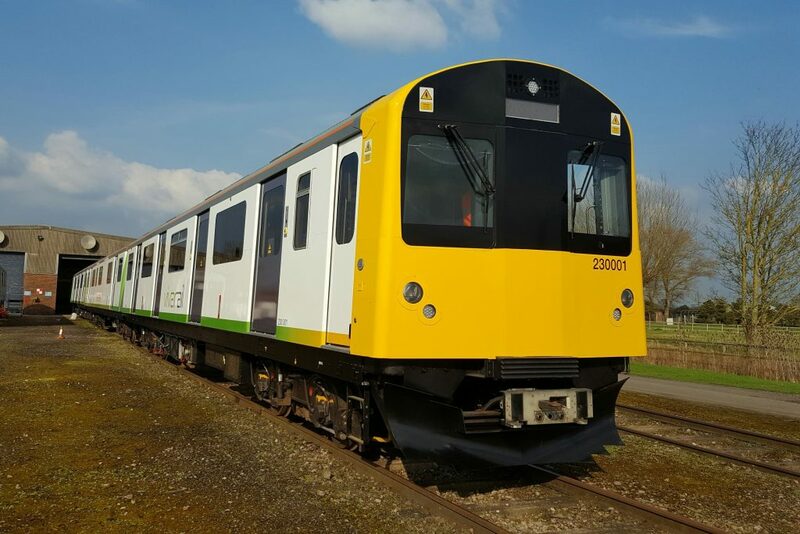 Vivarail Class 230 Vivarail has been developing a train for use on the main line based on former London Underground D Stock. The first prototype employed automotive diesel engines, generators, and a DC chopper control system driving the existing traction motors. More recently the company has been developing a battery-electric version with a view to offering a hybrid diesel/battery train which would operate through a three-phase drive and new AC traction motors. Bombardier Aventra Although nothing has been announced, Bombardier is rumoured to be working on a bi-mode version of its Aventra platform. Pros and cons As this article has shown, there are disadvantages of diesel-electric bi-mode trains – they are heavier and, in self-powered mode, noisier than electric trains. Battery power has yet to be deployed on UK main line railways, although trials have been promising. In all the applications described, the train’s self-powered performance is inferior to electric performance, in terms of range and/or acceleration. In the worst case, it is also inferior to the diesel trains they replace. Whilst this might not be all that important away from the trunk routes, it will matter on the busiest lines. Bi-mode trains, as currently specified and configured, will not deliver the run-time benefits planned from electrification when running on diesel. All this implies that main trunk routes should be electrified. But wasn’t that the original plan? That said, bi-mode trains offer considerable customer benefits in enabling through journeys beyond the electrified network that would have otherwise required a change of trains, time wasted attaching or removing locomotives or running diesel trains ‘under the wires’. They also allow trains to continue to run if the electrification system fails or on diversionary routes. The initiative also allowed the electrification programme to be de-linked from train purchases, so they could be deployed whilst electrification is still in progress. It does seem strange, though, that some new trains have been specified with an inferior performance on diesel power compared with the trains they will replace. Great credit goes to Abellio Greater Anglia and Stadler for providing new bi-mode trains with significant installed power that can more than keep up with electric trains and, on diesel, generally improve on the performance of the existing trains. And finally… Whilst researching this article, a colleague who works in France wondered what all the fuss is about. In France, they have to cope with both 25kV AC and 1.5V DC and lots of areas with no electrification, and they are used to lowering the pantograph to avoid obstructions. One of the reasons for the high cost of UK electrification is the need to raise bridges – why can’t the UK use neutral sections, for example? For some years French railways have also used bi-mode trains. These are dual-voltage and fitted with diesel generators (sometimes on the roof) so that trains go where customers want to go. Perhaps we need to learn some lessons from our neighbours? This article was written by Malcolm Dobell.